Alcohol and weight loss can be a poor match depending on how many liquid calories you are actually consuming. We all need a little down time now and then and if you're one who likes a cocktail with your R&R here are some quick guidelines to help you choose. 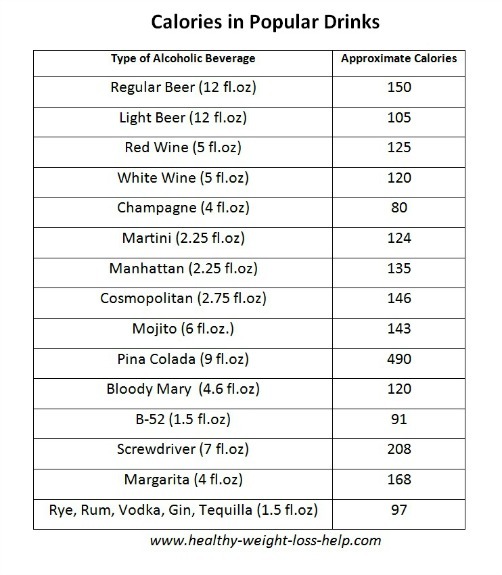 I have never been a big fan of calorie counting, but if there is ever a time you should be aware of calories is when you are consuming alcoholic beverages. It is easy to consume a stupidly high amount of calories in a short amount of time if you enjoy drinking. Here is a calorie chart of some popular drinks. These can be helpful giving us a pretty good idea of just how many calories we are ingesting. Calorie content will vary by recipe. If you are adding soda to the stronger liquors ( rum and coke), remember to add on the calories of the mix too. The number one thing to remember is that the calories in alcohol are empty calories, they do not provide any nutrition for our bodies. When you consume more calories than your body needs you will gain weight. One of the biggest drawbacks of drinking when wanting to lose weight is the way our bodies burn up those extra calories. Alcohol breaks down into the form of acetate, which the body will burn up before any other calories that we've eaten or stored, including fat and even sugar. In other words, our liver is so busy breaking down that drink that it will store the other fats in the body. Alcohol also temporarily inhibits "lipid oxidation" which means when you have alcohol in your system, it is harder for your body to break down and burn fat. These next three reasons are why weight gain can happen so much easier when one drinks. 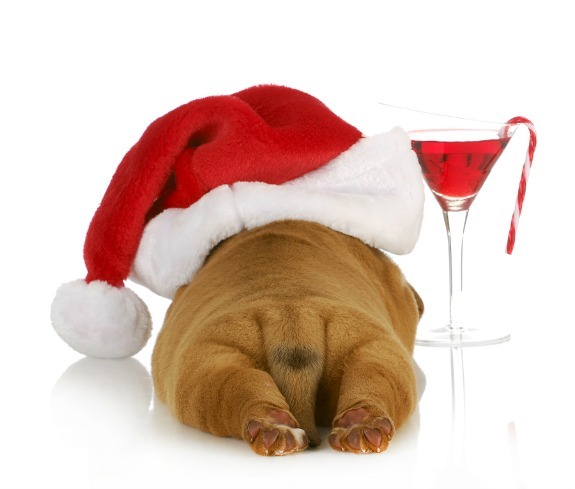 Alcohol is particularly toxic to the liver when consumed in excessive amounts. The liver begins to lose its functional capacity. How well your liver functions and weight gain are directly connected. If your liver is sluggish, weight loss will be extremely hard and even impossible for many. Got the munchies? Some studies have shown that after tipping back a couple of drinks that this can stimulate ones appetite. This can be particularly true when you're at a party that is serving food, especially a buffet style set up. It can become so easy to graze all those tables of food. It is hard enough to avoid fatty or sugary foods on an every day basis, even when there is no alcohol involved never mind after a few drinks surrounded by food. Having one too many the night before can leave you with a tiring hangover the next day. Forget the exercise today and pray that you can just make it through the day. Let's face it, a hangover leaves you dehydrated, clumsy and just plain tired. Think about your weight loss goals, that can be a good motivator not to over drink. Avoid high calorie drinks if you are trying to lose weight. Perhaps chose a light beer over a regular one or use diet soda as a mix. Like everything else in this world, moderation is truly the key. According to The National Institute of Alcohol Abuse & Alcoholism (NIAA), moderate drinking is defined as up to 4 alcoholic drinks for men in a single day, but not more than 14 for the whole week and up to 3 for women in any single day, but not more than 7 for the whole week. In fact, this type of moderation has some studies showing that drinking in moderation can actually be good for you offering benefits by reducing the risk of heart disease, stroke and heart attack. Though alcohol is definitely not required to maintain a healthy life. What is important is to refrain from smoking, get some daily exercise and enjoy a healthy diet. When dieting, try to avoid alcohol completely. Or if you like to indulge we know the trick is to drink in moderation and choose lower calorie drinks if you can.